The cell boundary is defined by the cell membrane. This is sometimes called the plasma membrane or plasmalemma. The cell membrane is a double layer of phospholipid molecules. 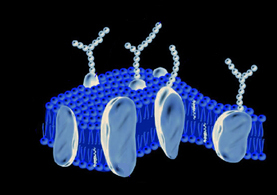 The plasma membrane is 8-10 nanometers thick. There are proteins in the cell membrane. Glycocalyx is a polysaccharide that can be found on the outer surface of the cell membranes. 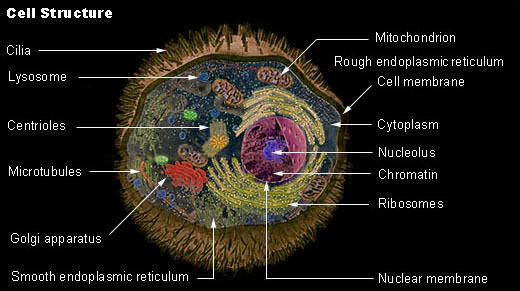 The nucleus is the control center of the cell. 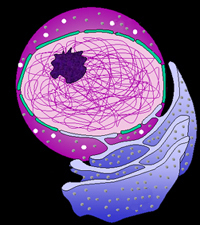 The nucleolus is a spherical area within the cell nucleus. The nucleolus is a dense region of ribonucleic acid (RNA) in the nucleus. It is the site of ribosome formation. Threads of chromatin in the nucleus contain deoxyribonucleic acid (DNA), the genetic material of the cell. The cytoplasm is the gel-like fluid inside the cell. It is the medium for chemical reaction. Cytoplasmic organelles are "little organs" within the cytoplasm. Mitochondria produce energy for the cell. The mitochondria is the site of ATP production for the cell. ATP is the energy currency of the cell. Mitochondria are nicknamed, the "powerhouse". Mitochondria are rich in fats, proteins, and enzymes. Ribosomes are RNA rich cytoplasmic granules. The ribosomes are the site of protein synthesis. Ribosomes are assembled in the nucleoli. The endoplasmic retiuclum is a system of interconnected membranes. The endoplasmic reticulum plays a role in the transport of materials within the cell. There is smooth endoplasmic reticulum and rough endoplasmic reticulum. If there are ribosomes on the tubules, the endoplasmic reticulum is called "rough endoplasmic reticulum". The ribosomes produce proteins. When the ribosomes are attached to endoplasmic reticulum, the proteins produced by the ribosomes are exported. If there are no ribosomes on the endoplasmic reticulum, it is called "smooth endoplasmic reticulum". The role of smooth endoplasmic reticulum is lipid metabolism. The Golgi apparatus is a cytoplasmic organelle that is composed of a stack of smooth membranous saccules and associated vesicles. The Golgi apparatus is active in the modification, sorting and transport of proteins. Lysosomes are membrane bound bags of digestive enzymes. They are nicknamed "suicide sacs". Peroxisomes are small, spherical structures found in the liver and kidney. Peroxisomes are also called microbodies. Peroxisomes contain enzymes for the breakdown of toxins. Catalase is one of the enzymes within peroxisomes. Catalase is involved in the breakdown of hydrogen peroxide. Microtubules are small tubules within the cell. Microtubules are composed of protein. Centrioles are made of microtubules. Centrioles are at the base of cilia and flagella. They are also involved with cell division. Different cell types will have different amounts and kinds of filaments. Microfilaments form the cell's cytoskeleton. Other filaments include myofilaments or neurofilaments. 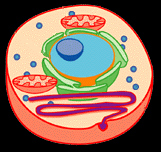 Organelles perform an activity and have an enrgy requiring job. Inclusions do not perform an energy requiring job. Examples of inclusions are pigment, glycogen, lipid, and secretory granules.